“In the face of difficult challenges, public servants give new life to the values that bind our Nation together. With determination and resolve, they defend our country overseas and work to widen the circle of opportunity and prosperity here at home. And despite tough circumstances — including pay freezes, budget cuts, sequestration, and a political climate that too often does not sufficiently value their work — these exceptional leaders continue to make real the fundamental truth that people who love their country can change it.” To read the president’s full proclamation, click here. His message was echoed by Senators who unanimously passed a resolution in support of public servants on May 1. The resolution introduced by Senators Heidi Heitkamp (D-North Dakota) and James Lankford (R-Oklahoma) honored federal, state and local government employees, both civilian and military, for their dedication and continued service to the United States. Whereas the ability of the Federal Government and State and local governments to be responsive, innovative, and effective depends on outstanding performance of dedicated public servants.” To read the full resolution, click here. Additionally, across the country, ASPA Chapters are showcasing outstanding contributions to public servants in their local communities. Pennsylvania: Our Central Pennsylvania Chapter will honor students, practitioners and scholars at its annual Public Service Excellence Awards Dinner on May 7. Click here to learn more. 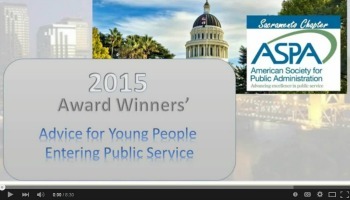 Sacramento: Our Sacaremento Chapter will host its Public Service Awards program on May 6. The Chapter interviewed its awardees to get their perspective on public service. Click on the images below to watch the videos. Seattle: The Evergreen Chapter has organized Public Service Night at the Seattle Mariners’ home game on May 8. To purchase a ticket, click here. Rhode Island: The Rhode Island Chapter will hold its annual Public Service Conference on May 6; it will feature the work of 20 high school students involved in their schools’ public administration, law and public safety academies. Texas: ASPA’s Central Texas Chapter is hosting its Annual Awards Banquet on May 14. Tickets are still available. Click here for more information. 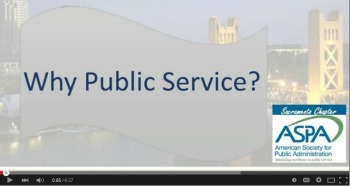 Missouri: Our Greater Kansas City Chapter hosts its annual Public Service Awards Breakfast on May 20. Visit the Chapter’s Facebook page to learn more. Washington, DC: The Public Employees Roundtable, of which ASPA is a member, has coordinated key events to commemorate PSRW. These include discount tickets to the Washington Nationals’ May 4 home game and the DC United home game on May 9. Click here to learn more. There also will be a 5K Walk/Run to support the Federal Employees Education Assistance Fund (FEEA) on May 10. In addition, President Obama has issued a proclamation in support of Public Service Recognition Week; to read it, click here. The U.S. Senate also passed a resolution honoring the contributions of public servants which you can read here.